Miss Adoro 'Cupcakes Gold Glitter' cosmetic brush set in clear with specks of gold. BE Beautiful – BE Bold!! This gorgeous yet fierce set includes 5 dual ended brushes, which makes 10 brushes total. With the amazing EXTRA LARGE Fan brush for highlight application or soft definition of the cheekbones. Made with VEGAN CRUELTY FREE Synthetic Fibers and Gold Glitter handles. Comes with a beautiful GOLD bag! Miss Adoro 'Diamonds are a Girls Best Friend!' cosmetic brush set in Rainbow Gemstone. This set of Rainbow gemstone colored handle brushes includes 7 perfectly curated brushes to meet yoru makeup needs. Crafted with only VEGAN CRUELTY FREE Synthetic Fibers and Rainbow Gemstone multicolor handles. The set includes a gorgeous IRIDESCENT AMETHYST colored bag! Create lush, natural-looking lashes with these permanently curled Miss Adoro False Eyelash #Flare Long Length Individual Lashes that attach to your own for extended wear. Place a few to build up volume of your lashes into customized looks, whether you want the subtle, dramatic or glamorous look! They are made of 100% human hair for easy and super light wearability. Create lush, natural-looking lashes with these permanently curled Miss Adoro False Eyelash #Flare Medium Length Individual Lashes that attach to your own for extended wear. Place a few to build up volume of your lashes into customized looks, whether you want the subtle, dramatic or glamorous look! They are made of 100% human hair for easy and super light wearability. Please note Miss Adoro False Eyelash #Flare Medium Length is currently out of stock; Item will be available again shortly. Try comparable style in Andrea MOD Perma-Lash FLARE Medium Length or Ardell Duralash Flare Medium Length. Create lush, natural-looking lashes with these permanently curled Miss Adoro False Eyelash #Flare Small Length Individual Lashes that attach to your own for extended wear. Place a few to build up volume of your lashes into customized looks, whether you want the subtle, dramatic or glamorous look! They are made of 100% human hair for easy and super light wearability. 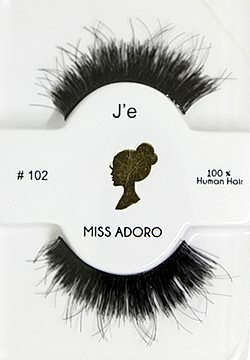 Please note Miss Adoro False Eyelash #Flare Small Length is currently out of stock; Item will be available again shortly. Try comparable style in Ardell Duralash Flare Short Length or Andrea MOD Perma-Lash FLARE Short Length. Miss Adoro False Eyelash #Single Long Length Individual Lashes. Single individual lashes blends seamlessly with your natural lashes, these Long Singles Individuals are curled for ease of application. Miss Adoro False Eyelash #Single Medium Length Individual Lashes. Single individual lashes blends seamlessly with your natural lashes, these Medium Singles Individuals are curled for ease of application. 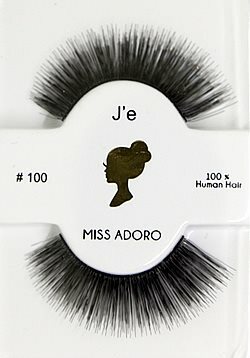 Miss Adoro False Eyelash #Single Small Length Individual Lashes. Single individual lashes blends seamlessly with your natural lashes, these Short Singles Individuals are curled for ease of application. Style is comparable to Bullseye BETTE Lashes and MAC 3 Lash. Miss Adoro Scarlet #100 Fake Eyelashes are bold, full fan style dramatic black falsies lashes featuring alluring simple design for eye opening effect. This hand-made human hair lashes adds length and flutter with natural look to inspire head turns and wow style! Miss Adoro Lola #101 False Eyelashes are full, bold, and lengthy black fan style lashes with extreme volume afluttered with natural look. This bold, full fan style dramatic lashes featuring alluring simple design for eye opening effect and wow style inspire to turn heads. Transform the natural look of your eyes in just a matter of minutes with Miss Adoro Selene False Eyelashes #102! These false eyelashes are long, wispy, and full black. They have super extreme length and volume, all the while feeling natural on the eyes, thanks to the fact that they are made of 100% human hair. These are bold, statement lashes which are perfect for performance, photoshoots, carnivals and costume parties. They will definitely make you stand out in the crowd.